Had he glanced over his shoulder just before the “great fish” swallowed him, biblical Jonah would have had an enviable view. Enviable, that is, if you’re Alex Werth, a landlocked biologist who studies the feeding anatomy of whales. “Ah, to be Jonah and watch baleen in action from a seat on a whale’s tongue,” he says. Baleen is the apparatus toothless whales rely on to filter food from the sea. Hundreds of these flexible plates, made of the structural protein keratin, grow downward from a whale’s upper jaw, lined up like the slats of venetian blinds. Fitting the plates into the mouth requires a large upper jaw, giving baleen whales a sort of upside-down grin. The feeding structure evolved stepwise some 30 million years ago when the oceans were full of toothed whales competing for limited food. Having developed a tool and taste for other kinds of prey, baleen whales—known collectively as mysticetes—eventually split off and diverged into 12 or more species including the blue whale, the largest animal ever to have lived, along with humpbacks, grays, and right whales. And, at least until American commercial whalers commenced heavy pursuit some 200 years ago, these relatively passive feeders gulping down little marine animals by the tonne did just fine. But while some of whales’ deep past continues to perplex, scientists today have discovered an unexpected source of clarity, a detailed treasure map hidden inside baleen. Information associated with keratin, either in the protein or alongside it, holds chemical timestamps and data on whales’ health, movements, and reproduction. “It’s as if these animals have been keeping a daily journal, and suddenly we can see what they’ve been writing,” says endocrinologist Kathleen Hunt of Northern Arizona University. 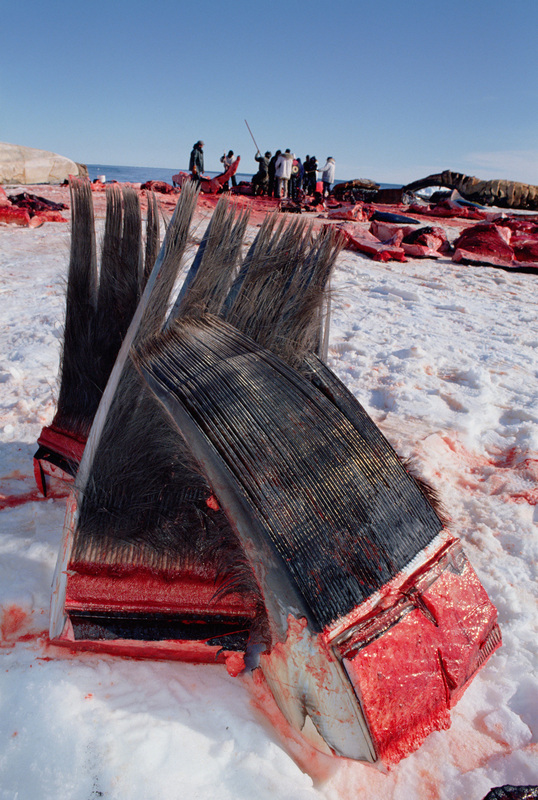 And the narrative unfolding from the baleen could inform whale conservation in whole new ways. How did whales make the jump from using teeth to baleen? Researchers from Museums Victoria and Monash University in Australia, with help from Alfred, a 25-million-year-old fossil whale, bring you the latest science. Werth’s lab at Hampden-Sydney College in Virginia, where he studies the hydromechanics of baleen, smells a bit whaley. Baleen is everywhere: long, desiccated slats lie on shelves; a quiver of tall, narrow plates wrapped in plastic, their gummy ends dunked in preservative, leans in the corner. And then there’s the 160 kilograms of fresh baleen in tightly lidded barrels in the hall, just arrived from collaborators in Alaska. Old baleen splits like fingernails, which reveals its structure: each curved plate is two flat keratin layers with rows of tubules, like miniature coils of tightly rolled luncheon meat, sandwiched between. The whale’s massive tongue and its prey washing in and out abrade the material, freeing up a sort of fringe at the edges—what Aristotle compared to “hog’s bristles.” The coarseness of those filaments, just as the size, shape, and number of baleen plates, depends on the species, and it is this hairy stuff that separates food from each mouthful of seawater. Consider the bowhead whale. The sleek black mammal with the white soul patch, native to Earth’s chilliest waters, is at the center of environmental change. It spends its entire life within the Arctic, moving seasonally with the edge of the pack ice as it forms and retreats. Feeding on almost two tonnes of fresh zooplankton daily, bowheads grow large, some to 18 meters, and live long, upwards of 100 years—possibly the longest of any modern mammal. For a baleen researcher, the species is pure gold. It has more and longer baleen plates (up to 350 per side at four meters apiece) than any other whale, including the gargantuan blue. Many Indigenous Alaskans who legally hunt bowheads will share baleen with researchers, thus Werth’s barrels in the hall. Whale-stranding networks provide another source. Older samples, going back to whaling expeditions of the mid-1800s, gather dust in museum storage cabinets and private collections, ripe for study. Kathleen Hunt, like Werth, is taking advantage of this resource. Ultimately she wants to know how bowheads are coping with the growing human impact on their environment. Melting ice is opening the Arctic to more ship traffic, seismic exploration, oil and gas development, and fishing. For marine mammals this translates to more ship strikes, more entanglements in fishing nets, and more noise. “Are they stressed out? Is human activity affecting their reproduction?” she asks. No one knows. One can, if extremely motivated and even more patient, collect feces, skin and blubber samples, and even respiratory vapor from a whale’s blowhole. But these offer only snapshots of a single point in time. Hunt wanted broader coverage. Earwax plugs lay down incremental data but it isn’t terribly precise, and the plugs are hard to extract intact from a skull, so supplies are limited. After Hunt “[flailed] around with poop and blow” for about 13 years, a colleague suggested baleen. After all, hair, hooves, horns, nails, and other vertebrate structures that are also made of keratin, hold all kinds of information, including endocrine data from the many glands sending hormones through the body. It turns out, baleen houses the same information, and it can be extracted from drilled-out, pulverized samples. Since the plates grow throughout an animal’s life, they continually capture hormonal signals—from the adrenal glands, gonads, and thyroid. “We can get data not just from the new part [of the baleen], but from the bit that’s been rattling around under the sea for a dozen or more years,” Hunt says. A plate erodes at one end as it grows at the other, so it represents a slice of life—sometimes 15 years worth. Hunt gleaned a lot about whale reproduction studying baleen from two female North Atlantic right whales, Stumpy and Staccato, that scientists had been observing off New England since the 1970s. A good bit of the whales’ life histories, including calving successes, were well documented, letting Hunt create a timeline for each—all the way to death (both died of ship strikes, one of them pregnant at the time). Since scientists have calculated an approximate growth rate for baleen—so much time per centimeter—Hunt could line up hormonal data extracted from the baleen with the whale’s experiences at that time of its life, suggesting important correlations. “Things like estrus cycles and age of sexual maturity, pregnancy rates, these are really a black box for researchers,” Hunt says, but now with baleen there may be potential to decipher them. She discovered clear patterns in progesterone (it is “screamingly high” during pregnancy) that partner with ups and downs in the stress hormone cortisol. Additionally, she says, thyroid hormones could reveal if an animal is starving (whales may “turn down” their metabolic rate to conserve energy) while a spike in aldosterone, used to conserve water, is shown in other animals to be a sign of stress so may signal the same in whales. Hunt believes having such information, which can be overlaid with environmental data such as sea temperatures, will open a portal on more complex mysteries. “Why are females not breeding in this area but are in that one?” she asks as an example. “Is it a nutritional problem? Are females losing calves or just not getting pregnant?” The right combination of datapoints could provide answers. 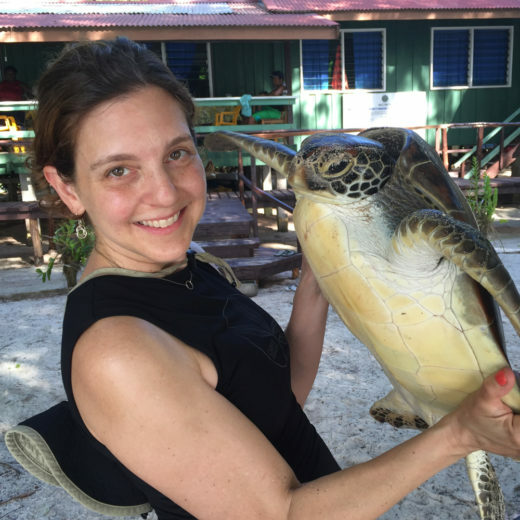 Additionally, finding correlations between changes in stress hormones and reproductive success, for example, “could be really useful in policymaking,” she says. And in the big picture there are the effects of climate change. “That’s, of course, a burning question,” says Hunt, and so far, scientists have no idea what those effects will be for whales. Perhaps as whale prey shifts in response to rising ocean temperatures, biologists will see nutritional stresses in the whales related to a change in or reduced amount of food. Hunt hypothesizes such an effect could be teased out of thyroid and other data. What Hunt has begun seems poised to pop the lids on many black boxes in the near future. Meanwhile, hormones aren’t the only chemical treasure trapped in baleen. Like Hunt, Alyson Fleming of the Smithsonian Institution is extracting otherwise invisible data from the mouths of whales. The biological oceanographer has handled hundreds of baleen samples in her studies of stable isotopes—elements including carbon and nitrogen with predictable “signatures” related to their mass. One form of carbon, for instance, has more neutrons than the other and thus is heavier and reacts differently in chemical and physical processes. What’s useful to Fleming is that these elements can act as tracers of different aspects of the environment, including, for a migrating whale, its geographic location and the trophic level (position in the food web) of what the whale has been eating. Take bowheads. These whales migrate seasonally between the Beaufort and Bering Seas, and those oceans, and the animals living in them, are isotopically different from one another. That’s in part because the Beaufort gets fresh water from river systems, and fresh water has a particular isotopic signature that shows up in the euphausiids, such as krill, and copepods it supports. Nourished by those prey species, the whales use oxygen, carbon, and nitrogen to build bone and baleen. And, helpfully, the ratios of those elements reflect the ocean the whales are feeding in at the time of growth. Sampling all along a baleen plate with mass spectrometry reveals the isotopic markers over time, including the transition from one ocean to another. Because researchers know the general timing of migrations between these oceans and can use that, along with isotope data, to gauge the baleen’s growth rate, the plates offer a sort of time-stamped map of a whale’s trip, including where it lingers to feed along the way. More specifically, Fleming explains that carbon isotope ratios can be correlated to both the amount and growth rate of phytoplankton—the drifting photosynthetic life at the base of the marine food chain. “So this is one rough way to assess how much productivity there is”—which ultimately translates into energy available to filter-feeding whales. Some of Fleming’s work could simply suggest which species are most threatened by environmental change, she says. “Previously we did a humpback project, using skin samples, looking at 20 years of foraging off California. What we found out is these animals were very flexible—they switched prey depending on what was abundant.” Humpbacks may be resourceful, she says, “but what about bowheads? The baleen can help answer that,” giving managers a tool in deciding where to focus their efforts. Baleen-based research is in its early days. Other researchers have reported on the dietary overlap between species (it’s useful to know whether animals are competing for the same prey, especially if that prey declines) and mercury exposure, and the pool of information keeps expanding. It’s clear that collaboration with other data gatherers—overlaying personal, physical, and environmental data from a whale’s life—has massive potential for conservation. There’s a very big picture squeezed into this peculiar anatomy, the scientists say, including the complex connections between ecosystem productivity, stress, reproduction, and even the human footprint in these remote habitats. For now, anyway. Today’s foes to whales are multiplying faster than the data about their lives can be assembled. Ship strikes and fishing gear entanglements are common enemy number one. Conservationists also worry about noise, warming temperatures and its many ramifications, exposure to polluted waters, and ocean acidification. These threats, especially combined, are extremely hard to quantify. But as researchers drill further into baleen’s molecular treasury, they’ll doubtless find new ways to use data from the past and present to plan for the future. The peculiar grin of the baleen whale is turning out to be full of surprises. Jennifer S. Holland is a freelance science writer and the author of the New York Times-bestselling Unlikely Friendships book series. Formerly she was a senior staff writer at National Geographic with a focus on natural history. Cite this Article: Jennifer S. Holland “The Oral History of Toothless Whales,” Hakai Magazine, Aug 29, 2017, accessed April 21st, 2019, https://www.hakaimagazine.com/features/oral-history-toothless-whales/.